Come to enjoy the most memorable moments of your life while learning something new! 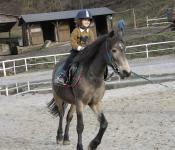 Sign up your child to our riding school for the essential education about horseback riding and horses in general. Let your children experience wonderful moments spent with these noble creatures, which will teach them the appreciation of animals, diligence, self-confidence, respect and responsibility. 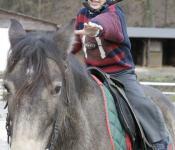 All with the assistance of experienced teachers in the friendly environment of our recreational riding center KOTVA in a natural preserve near Prague. These courses are taught in English, and also in Czech combined with teaching English language. Our course is made specifically for children. Our goal is to prepare for them an intellectually and physically stimulating time in a friendly and supportive environment. 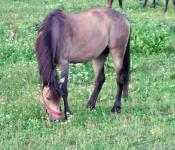 Our ponies were bread specifically for their exceptionally kind nature as a continued tradition of Ranch Kotva. They have no mean habits and they are used to working with children on a daily basis. Our main goal is to help your children develop new skills while emphasizing and teaching safety around horses and while horseback riding. 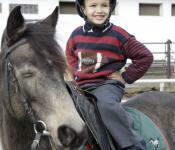 Our goal is to expand your child’s vocabulary and active use of English while learning new information about horses in vibrant interaction with other children and the teacher/trainer. 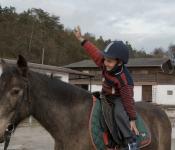 Pediatricians’ recommend lungeing exercises on horseback as they help to strengthen the muscles of your child and significantly contribute to overall core stability. 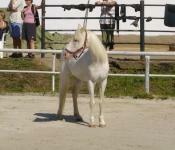 The teaching continues in three gates – walk, trot, and canter, depending on the individual’s ability to progress. 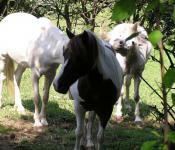 In a more advanced course, children will learn to lead the ponies on their own. The course will run once a week for two full hours in groups of 5 – 6 children. 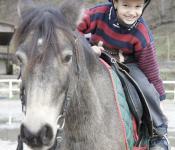 Each child will spend 20 minutes exercising on a horseback while lungeing (the maximum recommended time). This time will gradually extend up to 40 minutes spent in the saddle as the course advances. The course lasts 10 two-hour lectures. 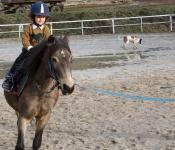 In case your child will not be able to attend one or at most two lessons, we will gladly compensate the practical part in our riding arena (schedule with trainer individually) and the teacher will hand over the studying material and walk your child through it. The course is not refundable.